(CNN) - Former Alaska Gov. Sarah Palin has weighed into another race for the U.S. Senate, this time endorsing the incumbent seeking reelection to the Utah seat he has held since 1976. Palin announced her backing for Orrin Hatch in a post to her website Tuesday evening, calling him "part of the one percent of national politicians who I think should be reelected." Her endorsement comes almost precisely a month after Hatch came within several dozen votes of avoiding a primary contest in his bid for a seventh term in the Senate. Hatch is known for reaching across the aisle on occasion, though in her endorsement, Palin touted his opposition against the health care reform led by President Barack Obama, as well as opposition to Obama's nominees for the Supreme Court. "We know he will use his seniority and influence to dissuade politicians from continuing to raise the debt ceiling without any plan to balance the budget and end these dangerously unsustainable deficits," she wrote. 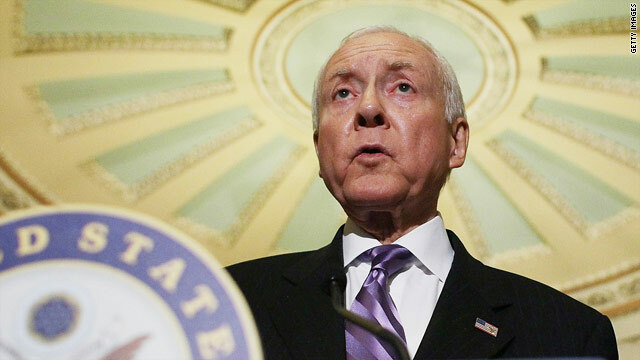 "And unlike some others, Orrin has gone out of his way to embrace the Tea Party movement." Palin made her case for Hatch in a television appearance last August, saying his support for a balanced budget amendment to the Constitution means "we need to be agreeing and embracing his idea and working with him to make sure that happens, instead of shooing him away and out of the Tea Party movement." Former state Sen. Dan Liljenquist will face Hatch in a June 26 primary, and in his first television advertisement, suggested the incumbent was being hypocritical to turn down televised debates, which Hatch had called for in his 1976 bid. One of Liljenquist's supporters has said he will protest Hatch's decision to only debate once, and on radio, by holding a personal hunger strike. National groups and figures have weighed in on the race, including GOP presidential candidate Mitt Romney, who endorsed Hatch. Palin's prior 2012 endorsements have included the backing of Indiana State Treasurer Richard Mourdock, who this month defeated incumbent Richard Lugar - who, like Hatch, started in the Senate in 1976. In other breaking news: Some undereducated, self-righteous loudmouthed middleaged woman just announced at the local bowling alley who she wants to be President. No one listens because, rightfully so, no one cares. Snooki Palin will destroy the GOBP convention in Tampa. She's planning now. I'm sorry, I was yawning. Something about what's her name? All of y’all Gay Muslim lovin’ Democrats and Liberals leave Sarah Palin alone now, ya hear!? She is the voice of us good pure Aryan Christian Conservative Tea Party peoples, who stand for Freedom, God, Guns, and Whites…no need for darn book learnin’ uppity city slickers in our neck of the woods. If Sarah Palin and her ‘kin can make it to Fox news and run for Assistant President than I must at least be as smart as she is. I'm sorry, why do I care what a person who quit her job as governor half way through thinks about politics? It is amazing how dumbness is so glorified in the Republican party. This is news? I thought her big endorsement would be for legalization of cocaine. She has first hand experience. She did go black, but went back.